In January 2017, the Icelandic nation was shaken to its core when the 19 year old Birna Brjánsdóttir disappeared in the middle of the night on the main street in the downtown area of Reykjavík. Surveillance cameras showed her walking up Laugavegur street, on her way home after a night out on the town with friends, but the cameras could not show how she suddenly vanished from view. For two weeks the whole nation followed the police investigation of this mystic affair and even took an active part in it, searching for evidence around the city. Finally two sailors on a Greenland trawler were arrested, and at the end of the month Birna’s body was found on a rocky beach on the south coast of Iceland. This tragic affair left no Icelanders untouched and Helgason wrote his poem shortly after witnessing the memorial gathering on Laugavegur, that took place on the very spot where she had been seen for the last time. 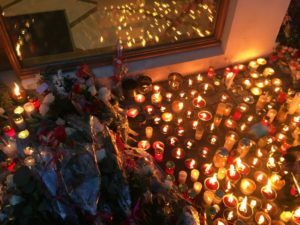 People were laying flowers on the pavement and lighted a sea of candles. In Helgason’s poem we follow Birna through the bars of Reykjavik, the last night of her life, and up Laugavegur where the poem imagines Birna herself, on her final walk, stumbling upon the flowers and candles lighted in her memory and filling the pavement in front of her. “Where she stands / Where she stares / At all her next steps / That light up the street with their flames / On this January morning”.